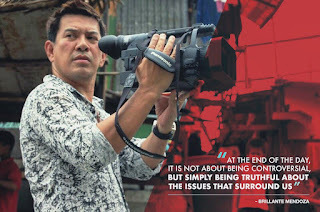 DIRECTOR BRILLANTE MENDOZA is the first local filmmaker to win the best director award at the prestigious Cannes Filmfest. He’s now also the first Pinoy director whose work, “Amo”, is currently being shown in Netflix, which specializes in video on demand, streaming online and DVD by mail. Its previous hits include “Stranger Things”, “House of Cards”, “Orange is the New Black”, “The Crown” and “13 Reasons Why”. “Amo” is about the war waged by Pres. Duterte against the drug menace. The story revolves on a high school student, played by newcomer Vince Rillon, who sidelines in drug trafficking and ends up embroiled in a ruthless world of corrupt politicians and law enforces and merciless drug kingpins. His recent film, “Ma Rosa”, also tackled the illegal drug trade and won the Cannes best actress award for Jaclyn Jose. But “Amo” has now become controversial. Human rights groups are against Mendoza, accusing “Amo”, which also stars Derek Ramsay and Allen Dizon playing cops, as a propaganda for the government who resorts to short cuts in killing accused drug traffickers. The mother of a victim of summary killing is now collecting signatures to petition Netflix to stop airing the show. Human rights advocates like Free Legal Assistant Group, Asian Network of People who use Drugs (ANPUD). International Network of People who Use Drugs (INPUD) Akbayan group and DAKILA group are asking Netflix to cancel the streaming of the show as it just glorifies Duterte’s war on drugs.